Dare To Leap With Outward Bound Canada! At Vancouver, We Love You we highly value the outdoors, and spending time in it. Fortunately for us we live in one of the most beautiful cities in the world and are surrounded by gorgeous mountains, rivers, lakes, woods, and oceans to explore. Being outdoors is not only good for your physical health, but mental health as well. That's why we love what Outward Bound Canada does. For almost 50 years, Outward Bound Canada has worked to cultivate resilience, leadership, connections, and compassion through inspiring and challenging journeys of self-discovery in the natural world. urban youth at risk to exciting and adventurous challenges right in their local urban neighbourhoods. The Urban Adventure Program was launched in Vancouver through partnership with local school boards and has introduced 500 disadvantaged youth to the incredible wilderness over the past year. 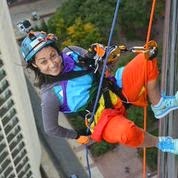 On April 16th join 75+ adventurers in rappelling 200ft down the Shaw Tower, the third tallest building in Vancouver as part of the first annual Dare to Leap fundraiser in support of Outward Bound Canada's new Urban Youth Program. Dare to Leap is an exclusive challenge event that calls on participants to raise pledges in exchange for a once-in-a-lifetime experience. For those interested in the ultimate adventure, individuals can still register or donate to participants here.